Spirits can be found everywhere in Okinawa, the Island prefecture just west of Kyushu, Japan. Some take the form of protective guardians, while others are 86 Proof and add to the unique flavours of the destination. In November I had the pleasure of accepting an invitation to attend the 2011 Japan Travel Mart in Yokohama. One of the attractions for me was the opportunity to take a short fam trip to Okinawa and, as I suspected, it was a more than worthwhile experience. Okinawa consists of a series of islands, sometimes referred to as the Ryukyus (The Ryukyu Kingdom occupied the island chain before being overtaken by a Samurai Lord in the 17th century, and then ultimately annexed to Japan in 1879). Mainland Okinawa consists of the capital city of Naha, as well as beach resorts, cultural villages, one of the largest aquariums in the world, the Gyokusendo Cave, featuring over one million stalactites, and at least one village that celebrates the traditional longevity of the Ryukyuans, through diet, exercise and lifestyle practices, and memorials to the shocking battles that took place at the close of the Second World War..
After the 2 ½ hour flight from Tokyo, one of the first lessons that Yuko, our guide taught us was on the characteristics of Okinawan food and drink. Pork is the most popular meat on the island and Okinawa Soba is pretty well the island’s ‘national’ dish. It consists of a soup with thick wheat noodles (soba usually refers to buckwheat noodles—except in Okinawa), topped with seaweed, pork, fish cake and scallions, and is usually eaten with a liberal sprinkling of chili powder. We were also told about ‘goya’, which resembles a cucumber with a severe wart problem. It is very bitter, but actually adds an interesting flavour when mixed with vegetables, sauces and meats. And then we were told about awamori. Awamori is a unique Okinawan alcoholic beverage. Unlike Japanese Sake, which is brewed, Awamori is distilled in a similar fashion to Japanese Shochu, but made exclusively from Thai rice. It packs a punch with a 30-43% alcohol content. In fact, during our ‘scientific investigation’ of shops selling awamori, we were told that some brands have as much as 60% alcohol but they are not allowed to be labeled as such and are usually found in the no-name section of the shop. The most popular way of drinking awamori is either straight up, with ice, or mixed with Shikuwasa Juice—a sour lime drink. 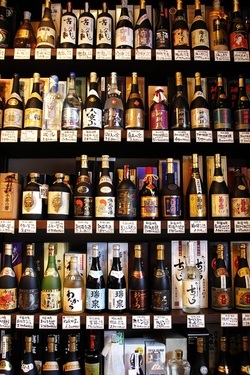 And a special insider’s tip….most hotel gift shops sell awamori and are more than willing to provide ample samples of the spirit. As there are literally hundreds of different types of awamori, you can do an awful lot of sampling if you prefer this as a (free) alternate to sitting in the hotel bar. Well, needless to say, we tried almost everything and liked almost everything! Part of the process of easing yourself into a destination is to sample the local cuisine and come away with some opinion about the taste, so you can talk to your clients about it, and of course culinary and drink tourism is one of the fastest growing niche markets. I will say without hesitation that there are some occasions where I personally draw the line. Flattened, packaged spicy pig faces seem to be a popular treat sold in the markets. All you need to do when you get home is steam them and then start munching —but we decided to pass on this treat. We also declined to sample snake liquor, which consist of a fermented habu, or poisonous snake in a bottle of awamori. Spirit guardians are ubiquitous in Okinawa in the form of lion/dogs, or Shiisa statues, found on the roofs of houses and shops, in gardens, and definitely in gift shops. Shiisas are usually occur in pairs with the closed mouth lion/dog on the left, to hold in good spirits and the open-mouthed Shiisa on the right, to ward off evil spirits. Shiisas, which are derived from the guardian lions of China, come in all shapes, sizes, colours and styles, including art nouveau and with children’s cartoon versions. After spending our first two nights at beach-type resorts in the north of the island, we started heading back down south to the capital city of Naha. Hearing that the main street, Kokusai-dori was a one mile stretch of stores, restaurants and bars, as well as the entrance to the covered shopping arcade and the public market, we readied ourselves for an afternoon of spending and photos. Many of the stores are geared toward the local-and visiting- youth who flock to the city for the American-style culture, mixed appropriately with Japanese influences, and therefore stores featuring giant plastic replicas of manga (Japanese cartoon) and American characters are part of the landscape. The awamori shops are visual feasts with hundreds of bottles stacked to the ceiling, each with a multi-coloured and usually beautifully decorated label. The covered arcade includes food stalls, shops selling the Okinawa 3 stringed ‘guitar” (the Sanshin), T-shirts, clothing, luggage and more. It adjoins the Public market where fish and seafood of all colours and varieties can be found (as well as those legendary pig faces and other pork products) and on the second floor you can sit down to an inexpensive meal of melt-in-your mouth sashimi of a quality you would never find in Canada, as well as sushi, noodles, soups and the famous Okinawa ice cream. Not far from the Public Market is the 400 year old pottery street where you can enter ceramic heaven (for those niche market enthusiasts), and where everything from sake cups to plates and bowls and decorative art can be found in the small crowded shops and cafes. And no visit to Naha would be complete without exploring the historic, reconstructed Shuri Castle, once the royal palace of the Ryukyu Kingdom, and later, almost completely destroyed during the Battle of Okinawa in 1945. Okinawa was a real eye-opener and a great place to spend a few days as part of a longer stay in Japan, or even as an add-on for those visiting Taiwan or South Korea. The outer islands of the Ryukyus are supposedly beautiful and ideal for scuba diving and snorkeling, but this time around we did not have a chance to explore them. Still, the mainland is worth a visit. Rental cars are plenty, hotels and resorts cater to both package tours and FITs, and the friendliness of the people, as well as your own penchant for discovery, can make this a very rewarding and truly spirited adventure.